Bimal Gurung today held a meeting with around 600 party supporters from the Dooars and the Terai to discuss strategies for the ensuing agitation for Gorkhaland and asked them to lend support to the movement as and when it was needed. The Gorkha Janmukti Morcha has faced criticism from its supporters in the plains for having forgotten them after the GTA came into being in 2011. "I have never left you in the wilderness. We worked hard and elected many leaders to panchayats and school managing committees. This was because I cannot give you anything from the GTA. But I believed that the leaders would deliver. The supporters are active even now but it is the leaders who lost their way in the plains," Gurung told the workers at Gorkha Rangmanch Bhavan here and urged them to come up with their own strategies. The Dooars and the Terai are not under the jurisdiction of the GTA. Before the Assembly elections this year, Kalchini MLA Wilson Champramary, who had won with Morcha support in 2011, joined Trinamul. Even leaders like Padam Lama, who was the Morcha's head in the Dooars, switched over to the ruling party, along with their supporters. Talking about the statehood agitation that the Morcha was planning, Gurung urged the supporters from the plains not to be scared of the cases the administration was likely to register against them. "The agitation will be unstoppable. If one has to go to jail for the community's sake, one should. During the agitation, those who go to jail will be the safest. Those who are not in jail will have to face the agitation," said the Morcha president. Gurung said the state could go to any extent. "The state government can go to any extent. They can even spray bullets in the hills," he said. The Morcha leader, however, said he would not ask the supporters from the plains to start an agitation immediately. "I will not ask you to hit the streets and block roads and stop trains. The agitation will be mostly in Darjeeling, Kalimpong, Kurseong and Delhi. I only want you to lend your voice when it is needed," said Gurung. 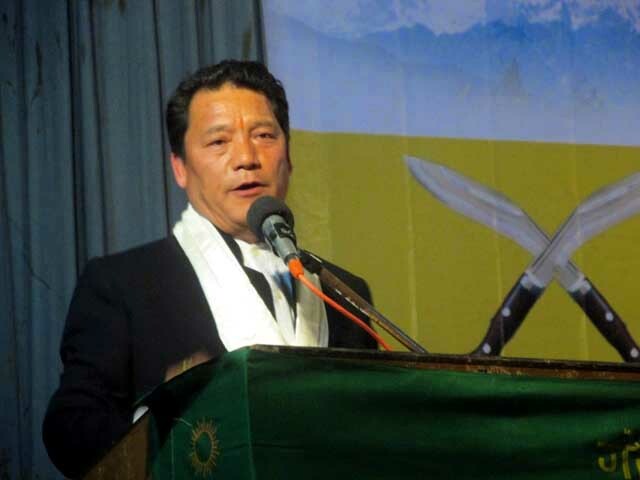 Gurung has said he could even call a general strike in the hills and there is a possibility of members of the Gorkhaland Personnel sitting on an indefinite hunger strike in Delhi. "Union home minister Rajnath Singh had called me recently and told me that he would meet us after October 2. We will also include representatives from the plains. A lot of things will also depend on that meeting." Gurung also said: "Mamata Banerjee is visiting Kalimpong tomorrow and I want to say I am not scared of her."